A Kitchener woman has won $600,000 via a scratch ticket purchased at a store on Doon Village Road in Kitchener. Bogdanka Knol, 64, played the Bigger Spin instant game. “My life has changed in a matter of minutes,” she was quoted as saying in a press release. The game consists of three parts: a scratch and watch option where players can win additional prizes between $10 and $150,000 or a Bigger Spin. Knol’s spin landed on the Bigger Spin, which has a guaranteed prize between $500,000 and $1 million. 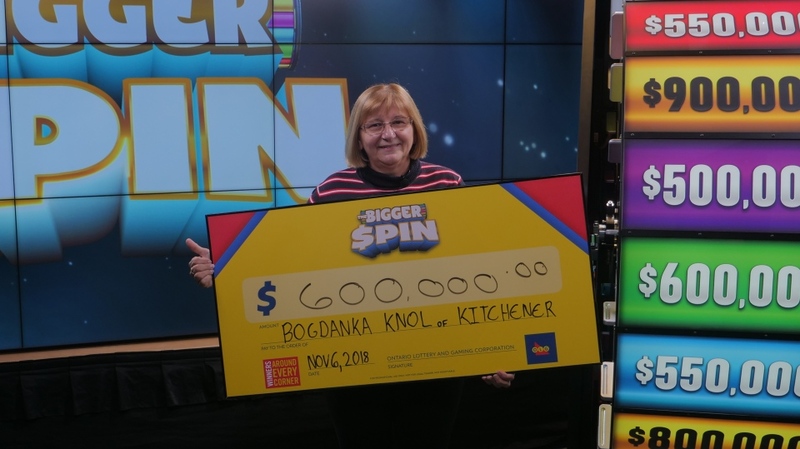 She took the spin at the OLG Prize Centre in Toronto, where she won her $600,000 prize. In recent days, a Waterloo man and a Cambridge man were both announced as winning $1 million. Those wins came on the heels of the lotto fever that saw a record $113 million up for grabs in the Lotto Max draw on Oct. 19.